I would like to start a Thread to Discus the Alien/s that would appear in Alien Covenant: i started a similar Alien Covenant thread not long ago discussing Paradise and what the Look and Feel of that World will be like. For this one its time to look at the Xenomorph Monster/s that will appear in this movie.. by first looking at Officially what we know about them. 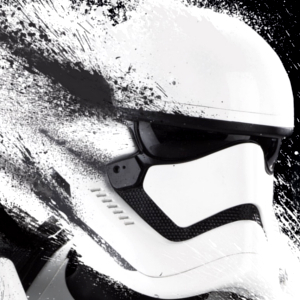 By that i mean discounting any none-official leaks or images. *Ridley Scott (RS) has confirmed this movie will focus on the Xenomorph to more extent and the aim is to show us where this Organism eventually comes from, who created it and why. *(RS) claimed that we would find out who would make such a Horrid Thing, it felt Bio-Mechanical and a Weapon and we would see why/how. *(RS) claimed that they (Engineers) created it (which could mean they played a role in the eventual Organism we see in Alien and its created either by them, from something they had created or obtained and experimented with). *(RS) claimed that there is something Evolving on Paradise, thats related to the Xenomorph and Engineer Bio-Weapons. (its a case of is this Evolving Creature something that is there and evolving when David arrives, or David evolves something he finds or is it something David creates that is evolving by the time the Covenant Crew arrive?). *(RS) claimed we will see every stage of the Aliens Life Cycle... Egg, Face Hugger, Chest Buster and then Big Chap. (This means we would see these stages at some point in the movie but while its bound to be similar we cant guarantee a exact Xeno Match in this movie). *(RS) claimed there would be Evolution to this movie from Prometheus, and it would back into Alien eventually after 3 movies. (maybe is a hint that we would see some clues to the evolutionary process that lead or leads to the Alien Xenomorph). *(RS) claimed they are going to rival the Chest Buster Scene from Alien, and go back to making what Scared people about the Monster in the first movie. *John Logan said you cant do a Alien Prequel without eventually not showing the Alien Life Cycle... from Egg to the Adult Xenomorph. *Micheal Fassbender (MF) claimed that there would be Alien's bursting out of people all over the place, he also claimed the movie brings back the Horror Element that Alien had and Ridley is going to Scare the Crap out of people. *(MF) Mentioned about the Neomorph in relation to John Hursts Chest Buster performance in Alien. (his comments seem to indicate we would be seeing similar scenes in this movie, and once again touching upon the Neo-Morph introduction to the New-Born/Young Stage of the Xenomorph). But could be a hint at something else... which could be either New.. or a Origin to how the Xeno came to be. *Danny Mcbride also commented on the Aliens being Scary, and that he (they) spend some time being chased around on the ship by Alien's while being armed with a Shotgun (not a Good idea) and also that the cast members he worked with were one by one not coming back to the breakfast table on set... (which could hint at a picking off of the crew bit by bit like we saw in Alien and Alien 3, rather than some Mass killings). 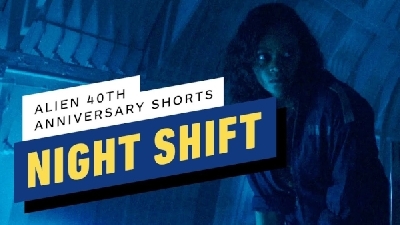 *Carmen Ejogo claimed that she and Katherine Waterston were being chased by Enormous Alien's (quite how big enormous is anyone's guess, but its safe to say at least a Xenomorph size but maybe no bigger than the Xenomorph Queen). *Katherine Waterston claimed too that the movie was Scary and the Alien's too and that she was being chased by enormous Alien's too while in a cumbersome spacesuit. *Wayne Haag mentioned that the Xenomorph could be Ancient, and maybe they will be keeping some Mystery about it as if you find out too much.. there is not Mystery left... he also claimed the Engineers found/stole something related to their Technology.... could this be Sacrificial Goo, Black Goo the Xeno? Who knows..
*We got to see the first official Image related to any Alien Monsters a Prop of Alien hands being worked on with the Tagline.. "where it all begins" These hands are different to the Xenomorphs a bit and they look less Bio-Mechanical and they have the Alien 3 Xenomorph kind of look to them... maybe slightly different digit layout. But we can safely Assume the shots of Eggs and Face Hugger including concepts seen in those photos are very likely in the movie. The rest who knows..
*The Production crew were given various items of clothing that showed Elements of the Xenomorph.... some with Face Huger and some with the Alien Design.... these however with also the HR Giger Necronom IV Clapper board.... do-not mean we would be getting this exact design... but working on the path to it or a more clear path from it... so there would be more connection... and if these things actually appear... then maybe there is some part of the Creation/Origin and Evolution that is not shown in the previous Alien movies that we shall be shown in Alien Covenant. 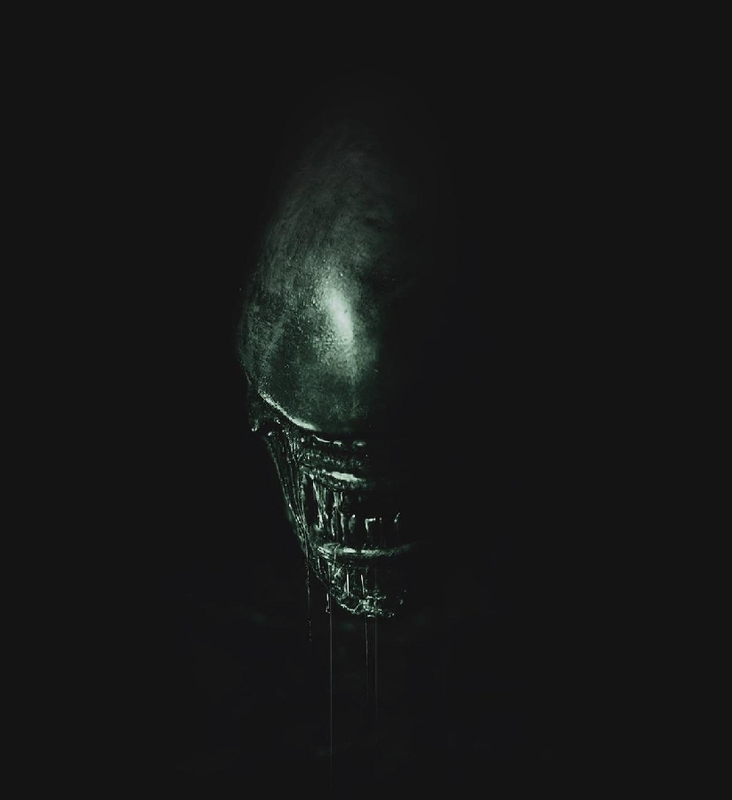 *We Finally get the First Official Teaser Poster with a image of a Xenomorph that again is not quite as Bio-Mechanical as Alien but similar to the Alien 3 one. The Question is how many types we would see, and how much of a Evolutionary Process.. we cant be sure of this but only that. *We will see some Evolutionary link to a process that creates/leads to related Organisms. *At least one kind of Organism we will see from a Egg stage to the Adult Stage. *At least one kind of Organism will be very close to the Xenomorph... maybe not 100% the exact Monster in those Eggs... i think we have some more exploring/evolution before we get to them. Great topic Big Dave, nice to see all the officially acknowledged content in a list like that. It is interesting that the Alien head on the poster is reminiscent of the Dog Alien from Alien 3... And just so happens some of the makeup artists working on Covenant received model kits of the Alien 3 head. Coincidence? Alien Warrior Alien Resurrection’ by Bruce Hansing. I am not saying this is exactly what we would see... but from what information we have.. it appears it could be close to this... with the 4 Apendages on the back maybe being more spiked? Great list. Glad we finally cleared some things up. You definitely were more effective at it then I (then again, I haven't been here very long). 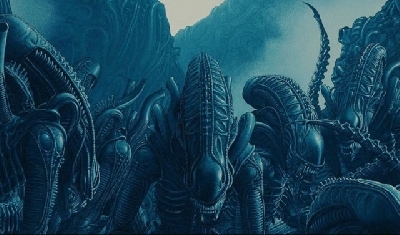 I think it would be cool to see the black xeno devour the white ones at some point in the film, as they are "inferior"
I love your topic about the xenomorph, I never knew that Danny Micbride was chased by an alien, you know how to explain very complicated things! 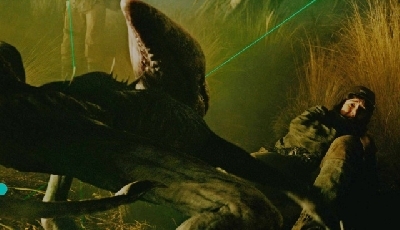 Throughout the Alien franchise and Prometheus there have been various xeno designs based on different animals. Fincher’s design was based on a dog and in Prometheus we had the cobrahugger. There would appear to be a little more info coming out now about the Covenant. I’m wondering and hoping that there will be some unexpected surprises in there is a pet cat, dog or budgie with the crew. If there is livestock on board, who knows if this could have some bearing on the overall lifecycle of the Xeno. We don’t know what lifeforms might exist on the Engineers planet. Until the movie is released I do feel there is plenty of potential to discuss for what we will eventually see. I personally would like to see xeno related lifeforms in whatever form they take. Holding out for Neomorphs, but it's looking pretty bleak on that front. i think there is potential to explore different kinds of Organisms in this movie... maybe native... maybe what once was.. or not. 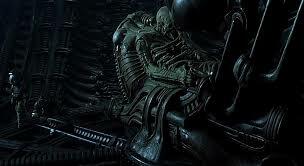 At very least i have a feeling we would be seeing more than just the usual Alien movie fair... with Egg ==> Xenomorph. I think this for certain is one Element we would definitely see... but i think they could be exploring other alternatives too. Prometheus did intend to have 3 Monsters... Hammerpedes (evolved from those Worms), Fifield Mutation.... and the Deacon and its Life Cycle... Squid Fetus in Shaws Womb, to Adult Trillobite Face Huger to the Deacon Chest Buster. Spaights version had 6 different Monsters... maybe 5? depends on interpretation..... we had Hammerpede/Centipedes... We had the Face Huger that lead to Holloways Chest Buster... we had a different Face Huger that leads to Watts (Shaws) Chest Buster that was removed via C-Section... we had a few Xenomorphs that was the result of some of the Crew Guarding Equipment being Face Hugged... and then the Ultramorph from the Engineer. But for certain we are going to see Egg, Face Huger a Chest Buster and Big Chap..... and also the Organism in that poster? if this is not part of that Cycle... and also maybe it is also what those Prop hands belonged to? I will post my one reply here.. as i think it may apply to the Poster Xeno at the end and the Eggs. f say they went for..... and this is just a complete made up theory.... so its not to say what will happen... maybe it could.. but its just a example..
Black Goo is used in a War Thousands of years ago... it creates either Spores that can Mutate People into Eggs, or so they give birth to something that can produce Eggs.... or the result of this Ancient Black Goo Outbreak leads to some way that Eggs are left on Paradise. David discovers these or something related and he experiments... or maybe he uses the Black Goo on something and Eggs are a result? The end of the Movie Walter Sacrifices himself to save some of the Crew and he is infected with either Black Goo, or some kind of Face Huger (that does not produce Bio-Mechanical Organisms when it infects Humans). But as this Organism infects a Synthetic Construct (Walter) who if we assume is Part Synthetic and Organic and the result is something more Bio-Mechanical than the Deacon was..
Give clues to how the Xeno could have started... or even how it could have also in the past.... The Fans would get Answers if they are going the route... Walter Chest Buster = Proto Xeno. We would know how the Xeno came to be.... but we would not know the starting Point where the process or Goo came from. it would be like how Spaights draft showed Engineer Sacrifice infected a Primate with Engineer DNA that leads to Mankind.... his draft however did not Answer... how/where did the Primate come from and how/where did the Sacrificial Goo came from.... only that the combination with Engineer too lead to Mankind. So a similar route to the Xeno would give answers... but then keep the origins that lead to it (Black Goo + Original Organism) a Mystery.. This is not to say any of the above is going to happen... its just a way to Give Alien Fans some Answers and Xenos and retail some Mystery. I appreciate that the movie will focus more on the Xeno compared to Prometheus. The reason for doing prequels to Alien is to me to explain (in a way) how the Xeno came to be and to tie in the history of the Engineers to it. Hopefully they will be able to explain it in a clever way without being too obvious or too vague even though I am not sure how they will be able to do that. What evolves on Paradise is something that I am seriously interested in seeing. This what could be both the monster and how the story develops (is there anyone else here that has thought about this duality?). There are different stages of the it but I am not sure if I feel the need to see all of them. As long as they will be able to handle this in a smart way then I am OK with that. We have already seen this in Alien (1979) but as long as they will pull it off in a way that makes an interesting story then I am fine with it. There could be different monsters on Paradise, I think that they could be connected to the Xeno but they don’t all need to be Xeno monsters. Compare this to how you have cousins and so on although there shouldn’t be too many variations because that would be too similar to human beings. Hopefully they won't show us hoe the black goo came to be because it is fun to speculate. All we got in that regards was the Trillobite a Type of Face Hugger and Deacon a type of Xeno.. 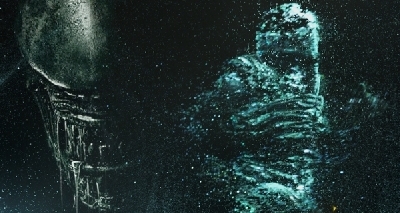 This time they have said we would see these and the poster is very Xeno compared to the Deacon... but like Prometheus i think this is a tease and this monster in the poster will happen at the end..
We would be shown other things related during the movie that they are keen to keep secret and also some other Plot suprises we never see coming..... i dont think the Engineer Connections and History are forgotten. They are throwing the Xeno out there to make us concentrate on just that... while hooking us in again.. I wander if any of the Monsters.. will use the Eyes or No Eyes style of design? The Middle set are HR Gigers first two Xeno concepts for Alien... his final one is different and just like the actual Xeno in Alien... but these other two are interesting and i wander if they could be touched upon in the next few movies? But this makes me think one Monsters will look like the Bottom Right image from that Montage in the previous post but more likely like the images posted on this post. The leaked photos before seemed to show a few different kinds of Baby-Xeno like Organisms and we cant be sure which ones or if all appear in the movie. First like the photo i posted a few posts back..
And i also came across these Zbrush Concept Fan Art that i think bears a very very good resemblance of how one of the leaked AC Prop Baby-Xenos would look when Adult. I have a feeling we will not see the biomechanical Xeno in Covenant- maybe a hint somehow at the end of the movie. That is my hope, mostly. That bottom photo is terrifying. I'm hoping for the eyeless design too and possibly more 'Necronomicon' Alien 'relations and cousins'. If not in A:C then in the follow-up. We cant take the supposed Leak of the Spores as 100% but it could be.. same goes for the Source from February 2015 (gained information November 2014). And we cant take those leaked Photos as 100% even though they do kind of support the Spore Leak in part and Source. What we do know for 100% is there would be something related to the 1979 Xenomorph, and we would see every part of a Alien Cycle from Egg to the Adult.... and then we have the Poster. 1) It will be in the movie a lot. 2) It will be in a bit, but other Monsters prior/after. 3)It will be a small Money Shot nod, like the Deacon at the end of Prometheus. What we do know is the movie will having a Evolving Organism that is there on Paradise prior to at least the Covenant and that the Engineers created it (or the means to produce it). And that we indeed will get multiple Aliens Bursting out of people and multiple chasing and killing people... but as far as if this is the ONE Monster in the Poster... or others... this is what we can only speculate on. *TWO MONSTERS as far as Adult Form. *TWO kinds of Baby-Monsters (actually more but they have two different kind of styles). *EGG and FACE HUGGER as far as similar to Alien Franchise. Right now i think the Egg, Face Huger and Poster Monster will all appear for certain.. to a degree at least. The Spore leak (October 2016)... claims at a Organism different to the Xeno, evolved from Spores on Paradise that was a result of Black Goo on the Environment. Latter addition also said there are also the ORIGINAL Xenos in the movie... Thus TWO MONSTERS. 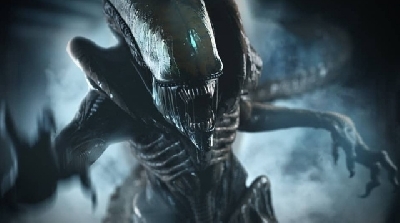 The Source leak Feb/March 2015 (information from November 2014) Also claimed TWO MONSTERS... both different to each other but similar to the Xenomorph in a way... One a Event prior the other a event created by David.... both aimed at giving us more answers to how the Xeno could be.... without showing the actual Xenomorph. 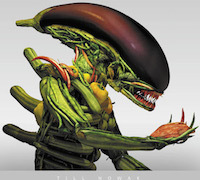 So as far as the Bio-Mechanical Xenomorph... i think we would get signs of at least how it could have been created (or Re-created as the Source claimed). and so maybe we would be shown Monsters that dont quite have the Bio-Mechanical Look of the 1979 Xenomorph.. but i think at least one event will give us something close. Different to the Aliens and Alien one as far as looks, but this is mainly based on Technology they had at the time.... so maybe a revamp we would see with TONED down Mechanical Looks... much like how Prometheus the Juggernaught was a toned down Organic Look compared to the Derelict. When we look at the Juggernaught and Derelict (apart from size difference) Aesthetically we can see similarities but then differences. I think its the same kind of difference we would see between the Alien Covenant: Poster Xenomorph and the 1979 Alien. The bottom two images of the neomorph are frighting and good looking. I like the fact that the monster that you posted doesn't have eyes, it gets scarier that way. "I just love the design. :)"
Indeed this is a fan art.... but to me it looks something we could imagine the grown up Baby one could turn out to be (one with Deacon Head not Baby-head one). We cant say which of those leaked concepts get used... but on the wall we did have TWO Monsters in drawing form... one very close to a Xeno the other very close to the Deacon and the one Baby Alien leaked Prop. 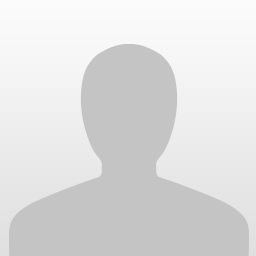 Are similar to the Fifield Concept.. I think looking at unused Fifield concepts and his infection and those Baby like Props i would conclude they would logically come about the same as Fifield infection. Which to me means something Goo/Spore related infects a Early Stage Human Pregnancy. After I studied the design, I developed a theory that the creature in the photo could actually be one of the covenant crew members. 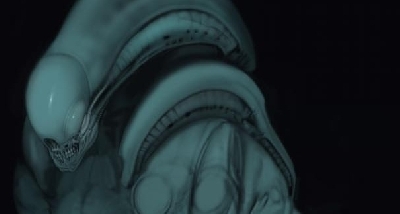 Notice how the lump on the side of the head looks a little like an ear and the tongue is more human-like rather than the second mouth of an alien. I really think this was one of the covenant crew members that got transformed by the black goo. I think we have to remember that work is a fan based one and its not officially concept.. but it looks like maybe what we could see. 1) Egg => Face Huger that infects its Host and leads to a Adult Alien down the line that has traits of its Host. 2) Prometheus shows us Black Goo+ Organism = Hybrid. like Fifield and Hammerpedes. 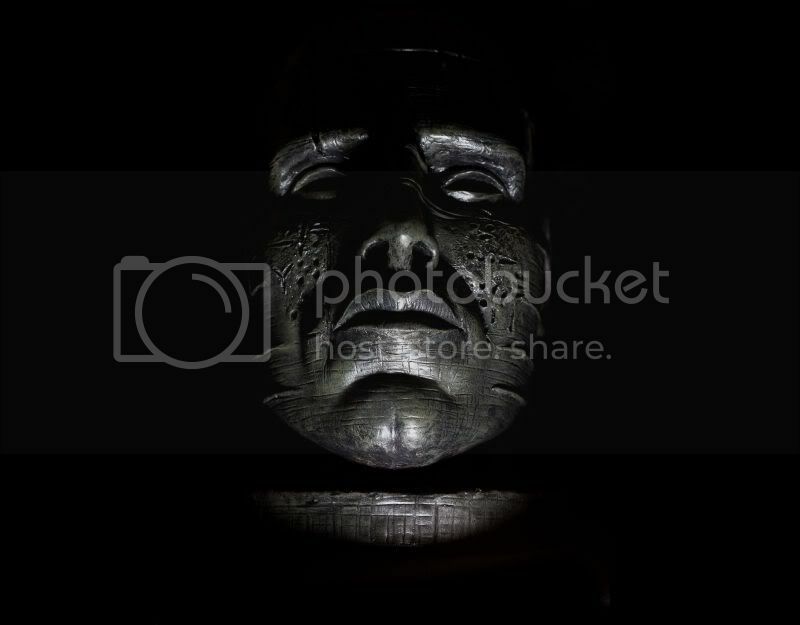 3) Black Goo or one top part passed onto a Female that infects the Eggs produces something related to a Hybrid Face Huger thats part Human at Face Huger Stage.. this leads to more Human DNA Chest Buster the Deacon. 4) Now we have the Spores that infect the crew and cause the creation of a Organism... we have to remember this is only considered a Rumor at the moment. But lets assume it sounds similar to a combination of effects that happened to Shaw and Fifield.... and indeed such Organism would also take on Hosts traits too. My first experience with this epic story was aliens 2. I was 10 years old the movie just released I rode my bike to the movie theater bought a ticket to a good rated film and snuck in to the aliens film. from there I was forever changed. Couple of things, the aliens are not just killing machines as expressed in aliens 2 when ripley walks in to the nest and the queen looks up. she points the flame thrower up in the air pulls the trigger stips and poimts it at the nest and the queen makes the alien gaurds back down so tjere is signs of intelligent thought. Also in alien 4 ressurection when the 2 aliens sacrifice their buddy to break free. etc. David sees more in the life form then just perfect blend of robot dna and organics. there is thought and underatanding within the species. Now i have not yet seen talk about what happened to the good dr who left with david to find the engineers home planet and ask why. so really this film ties in the alien stories but what about all the other questions? who are the engineers? why did the one flip and go rogue? etc. there needs to be another film dealing with these questions. On a side note i want more preditor home world stuff . we got a glimpse from last avp movie and i want more!!! Indeed Wes, the Xenomorph showed intelligence as well as primal instincts throughout the Alien Franchise. "David sees more in the life form then just perfect blend of robot dna and organics. there is thought and underatanding within the species." But he would surely be playing a role in creating something related at the very least and at first he may see pride in his creation just like God did with Mankind, like a Mother/Father have with their Child and also most likely how Weyland was with David. Your other Questions indeed i think these would be answered at some point and maybe Alien Covenant could help with those, but i wont go into detail much as its more a Topic for Engineers Post instead. So I just read something very interesting. It concerns the original concepts for the Belugas. It said something about the Belugamorphs being an early organic prototype of the Alien, and the bio-mechanical one is a "weaponized" version made by the engineers. I'm assuming the mechanical bits come from the eggs being rooted to the metal floor of the Juggernauts. Anyway, I also read that the Belugas were planned to have the ability to squeeze through cracks and tight spaces, as they had very thin to no skeletons. Could this be what that 4chan leak was referring to when it talked about a new way the xenomorph (and beluga) gets around? I think it's looking more and more like the Belugamorphs will make their appearance in the film. However, PLEASE take this with a GINORMOUS grain of salt. I can't wait to see the Neo - I imagine that this is what a Xeno would look like if it burst out of Slenderman. Thats a decent assumption, we dont know how the Xeno was Bio-Mechanical, the Black Goo seemed to pass on Xeno traits but lacked the Mechanical aspect, i had wondered if they was getting it from David etc in Prometheus before the movie came out and then AC, but its not my way i would like to do it. I think they was ancient.. The Face Hugger and Eggs lack the Bio-Mechnoid look, the Alien in AC looks less Mechanical but this is where Ridley teases we would find out how come it was Bio-Mechanical and a Weapon. I think the main connection all along as far as Aesthetics is the Xenomorph and the Derelict Ship, the Aesthetic of the Ships Tunnels and Construction is very similar to the Xenomorph Hive Construction. Now yes there are differences Aesthetically/size wise (ships and pilots) but we are to assume they are similar. So your assumption Alien 426 is a likely possible explanation, that some event may have caused the Black Goo or Eggs or something to fuse with the Mechanical Aesthetic of the Engineers Ships and so the Ships inherent Biological Matter off the Eggs or Black Goo and the Eggs evolve to take on Synthetic Material off the ship. This is logical to assume as they clearly look related, and i dont know say if a Ship Crashed and Spilled its Go and my some other component, say Plant Life that grew over the ship then made a recipe for the 3 elements to fuse and then start to grow. I mean the Derelict if we look outside we see the landscape has been infected and very Giger Bio-Mechanical too..... maybe a Spillage of contaminated and mixed components that changed the Ship could also then spilled out and infected the landscape?